Welcome to Monitor, the data acquisition and control newsletter. Thanks for subscribing. You can download this issue of Monitor as a pdf file from https://www.windmill.co.uk/monitor/monitor228.pdf. I recently purchased your Windmill Software in order to record data from an instrument that outputs a RS 232 serial string. It is not a standard instrument but it is a standard serial string. I need help to set up my RS 232 string from instrument to parse the data and record the string. Use the ComDebug software to enter parsing instructions to extract data from your string and save it in channels, temperature readings to one channel and pressure readings to another for example. Each data value can be up to 20 characters long. There is often no need to collect the units of the reading. You can use the SeupIML program to specify the units of each channel. Step 1 ignores everything in the instrument's data string until a number occurs. Step 2 extracts this number and everything after until it meets a space character. This example is used to extract data from strings sent by some weighing scales. Full details of parsing the data is at https://www.windmill.co.uk/parse.html and in the ComDebug program Help. You can use ComDebug to collect data. Simply press the Run button after you have set up parsing instructions. Alternatively you can use the Logger program. I'm using LibreOffice in this Spreadsheet Corner, but the procedure is the same for Excel. LibreOffice, like OpenOffice, is a free suite of software which many people use instead of Microsoft Office. When viewing a large spreadsheet of data it helps readablility if you format it so the rows are easily distinguised. 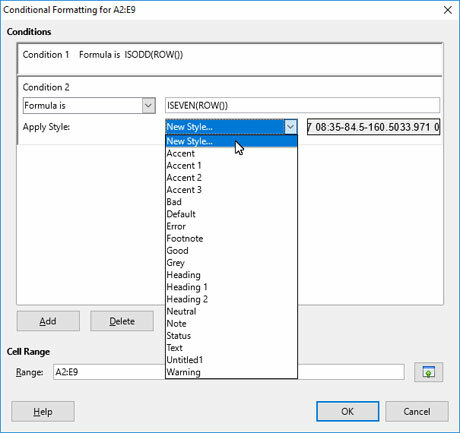 You can do this simply by choosing Autoformat styles from the Format menu, but you may prefer to choose your own formatting. There are two ways to do this. 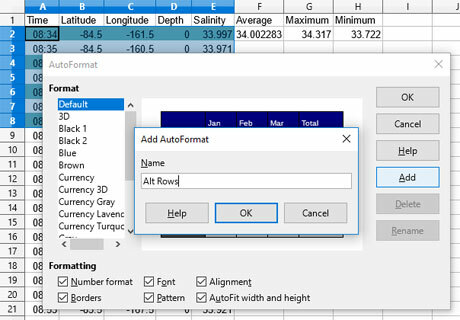 To easily configure an Autoformat style, containing your preferred font, number formats etc, just configure 5 rows of your data as you want it displayed. Choose AutoFormat styles from the Format menu, click Add and type a name for your new style. You can now apply this to all your data. This has some drawbacks though. You need at least 5 columns of data for it to work, and if you insert a new row you have to reformat the data. Instead you can use conditional formatting. Select the area you wish to format. Click New Style and choose the background you want. Click OK, and there is your formatting. A note on the formulae. ISODD returns true if the value is odd and false if even. It takes the format ISODD(value). ISEVEN is the opposite. If the answer is true then the formatting is applied. This applies to the Excel as well as LibreOffice. The sensor boosts surface-enhanced infrared absorption (SEIRA) spectroscopy to detect molecules at 100 to 1000 times greater resolution than previously attainable. Ultrathin, lightweight, breathable sensor constructed from nanoscale mesh, a spaghetti-like entanglement of fibres a thousand times thinner than a human hair - removing the discomfort of wear. Insects like bees can relay acquired information to their nest mates. The data gathering process is remarkably similar to that found in sensors commonly used in homes to detect human activity outside. Researchers at the University of Illinois have developed a diagnostic biosensor that uses a smartphone camera as a spectrometer. Industrial automation exhibition in its 29th year. For the automation, electrical equipment and energy industries. Measuring, control, automation and regulation technology. International trade fair for automation in production and assembly. 14th International exhibition of testing, measuring and control. Exhibition for smart factory technologies and IoT solutions.